Chop 1/4 x capsicum (for dressing) and slice the other 1/4 (for salad). Chop chilli and de-seed. To make the spicy capsicum mayonnaise, combine the chopped capsicum, chilli, mayonnaise, pepper and lemon juice together. Blend until well combined. Set aside. Tear the cos lettuce, slice cucumber and avocado. Combine with beef and remaining sliced capsicum in a big bowl. Spoon the spicy capsicum mayonnaise on top of the salad and season with pepper. Enjoy. 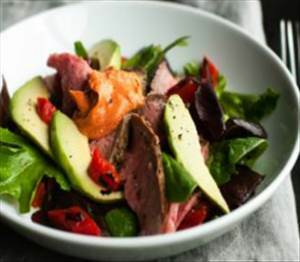 There are 283 calories in 1 serving of Beef Salad with Spicy Capsicum Mayo. Calorie Breakdown: 34% fat, 32% carbs, 34% prot.